Dhaka, Sep 9 (Just News): Road transport and bridges minister Obaidul Quader has expressed uncertainty over the completion of the Padma Bridge construction work by the scheduled time. ‘The Padma River is the most unpredictable one. Although everything is ready, I'm not still sure about its timely completion,’ said the minister while speaking at a press briefing at Saidpur Airport before starting his journey towards Dhaka at 10:30am on Sunday. 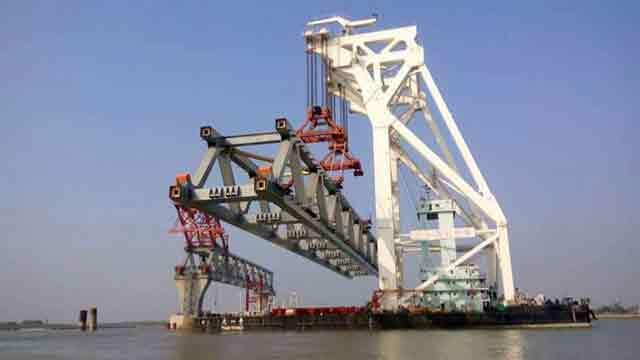 ‘It has become tough to install spans... now it has become a herculean task. The construction works are getting delayed for such uncertainty,’ he added. Turning to BNP, Quader, also Awami League general secretary, said Khaleda's party is trying to create anarchy over the upcoming national election having failed to wage any movement against the government. An Awami League delegation, led by party general secretary, Obaidul Quader, left Kamalapur Railway Station in the capital for Nilphamari by a train on Saturday morning aiming to carry out electioneering in northern districts. They held rallies at railway stations in Tangail, Pabna, Natore, Bogra, Joyurhat, Dinajpur and Nilphamari districts and directed the AL grassroots leaders to get ready for the election.